HD Radio technology is a method of transmitting audio and data. It transmits digital information instead of analog. HD Radio technology represents the evolution of traditional radio broadcasting into the digital age. Digital technology allows WUMB to transmit more data in the same amount of bandwidth. Primarily, this means higher quality sound. So much more so that FM transmissions have CD-like sound quality. AM radio uses smaller sections of bandwidth than FM. 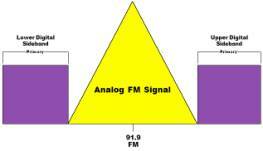 There is not enough bandwidth to give AM stations the same CD-quality signal as FM stations. But there is enough room to give AM stations clarity equivalent to current analog FM stereo radio. Gone are the days of "noisy" AM radio. This boost in sound quality is expected to make AM radio a viable, mainstream listening alternative to FM, which means more options for listeners. The digital signal is less vulnerable to reception problems. The radio tuner's digital processors eliminate the static, pops, hisses, and fades caused by interference. Multipath distortion, caused by the radio signal being reflected off of buildings and other surrounding obstructions, is completely removed. You hear only clear, clean, rich sound. Should you lose the digital signal for some reason (obstructing terrain, nearing the edge of the broadcast area, etc. ), HD Radio technology defaults back to analog mode, similar to the way current radios switch from stereo to mono mode when receiving a weak signal. The radio sacrifices detail in an effort to boost reception. Another benefit of digital radio is the radio station's ability to transmit additional information along with the music signal. Typically, this takes the form of scrolling text on your receiver's display, such as a song's artist and title and station call letters. WUMB sends out the analog and digital radio signals, along with a third signal for text data. The digital signal is compressed before being transmitted. The three-layered signal is transmitted from the radio station's upgraded digital transmitter. 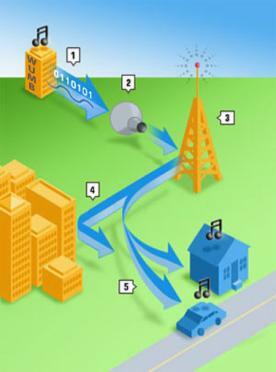 Multipath interference, caused by the signal reflecting off of buildings, is ignored by the digital radio, which is able to discern the true signal and ignore interference. Your radio receives the signal and, depending on your equipment, you hear either the digital or analog feed. HD Radio technology is not a subscription service, like satellite radio. It is the same free, over-the-air broadcast radio that we've always known. Only better. It is not something that consumers have to buy into. Everyone can choose to continue listening to their current radios, but eventually all AM/FM radios will incorporate digital technology. It is a natural evolution of the medium. Soon, if you turn on a radio, you'll be listening to an HD Radio tuner. HD Radio technology is not a competitor of satellite radio. It is an improvement to terrestrial AM and FM radio. Satellite radio is an alternative to terrestrial radio, in the same way that cable or satellite TV are alternatives to broadcast television. Even if you do have satellite radio, there are often times when you want to listen to local radio. WUMB was the first public radio station in New Enland to broadcast an HD Radio signal, starting in February, 2004. WDMK in Detroit, Michigan, was the first station licensed to broadcast in HD Radio signing on November 22, 2002. HD Radio technology is the most revolutionary advance in radio since 1919, when Frank Conrad, a Westinghouse engineer, founded radio broadcasting in a small, red brick garage behind his home in Pittsburgh, Pennsylvania. While HD Radio is unique to the United States, Europe has had a digital radio system called "Eureka 147" for a decade or more. It is a different scheme, in which five-or-more programming services share a single transmitter and antenna, and operates outside the FM radio dial.